Well built and comfortable but unspectacular. It costs a shade over $50 grand yet it has a puny 96kW engine, it doesn’t have the quattro AWD system and you need to pay extra for electric seats and a folding rear backrest. 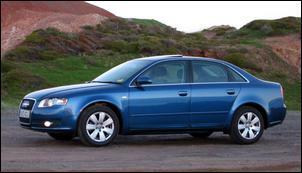 The cost-cutting is easy to see in the entry-level Audi A4 but it does come together as a well balanced - albeit far from high performance - sedan. Perhaps more importantly for the average A4 buyer, it also brings the style and build quality found in other Audi models costing substantially more. The A4 2.0 litre has top-shelf build quality that’s evident everywhere you look. The panel fit of our test car was spot-on, paint quality was brilliant and the interior uses the same quality materials you’ll find in an Audi A8 costing four times as much. 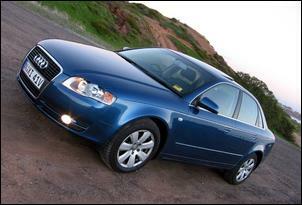 If you want a high quality car, the A4 2.0 litre is a relatively cheap way to get it. But if you’re into driving, there’s not a lot to sink your teeth into. At 1345kg, the A4 has average weight for its class but its naturally aspirated 2.0 litre 4-cylinder would be more at home in the smaller A3. The DOHC 2.0 litre uses variable inlet cam timing, a 2-stage intake manifold, electronic throttle control and generates a mild 96kW at 5700 rpm and 195Nm at 3300 rpm (with 90 percent of peak torque available from 2300 to 5000 rpm). Real-world acceleration is nothing more than average and there are times when you wish there were another 20 or 30 kilowatts (as there are in the 1.8 litre turbo version). But, overall, the 2.0 litre’s performance is not as bad you might first expect. The engine is responsive and torquey through the low to mid rev range and the optional Multitronic transmission (as fitted to our test car) is well matched. The Multitronic is a continuously variable transmission with 7 predefined gear ratios. With so many ratios, you can extract maximum possible performance from the engine. A standing start sprint to 100 km/h takes around 10.5 seconds. Of course, this level of performance is hardly scintillating which makes filling the tank with 95 RON premium unleaded (as recommended) a bit hard to swallow. Fortunately, the A4 2.0 litre gives decent fuel consumption – a combination of aggressive city/urban driving and country driving returned 9.5 litres per 100km during our test. The touring range is excellent thanks to a 70 litre fuel tank. The A4’s suspension tune is well matched to its performance abilities. The aluminium 4-link front and trapezoidal-link rear suspension (now with altered damper rates and components from the S4 and A6) gives a comfortable ride over even the most punishing shopping centre speed humps. Rebound damping is oh-so-slightly too soft on B-grade country roads but we doubt whether many drivers would notice. 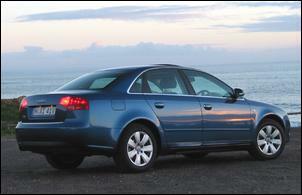 The front-wheel-drive A4 is a determined understeerer that is unfussed by a mid-corner throttle lift-off. The Electronic Stabilisation Program lets the front run a long way wide in dry conditions but, interestingly, it catches understeer much earlier in the wet. The standard 215/55 16 Michelin Pilot Primacy tyres also start to slip at relatively low cornering loads but are progressive – they don’t grip and then let go like some other Audi models we’ve tested. Traction off the line is fine except when accelerating hard across a wet road – in these conditions the traction control system is too heavy-handed and almost completely shuts down the engine. If you want total traction, Audi wants you to buy a quattro. 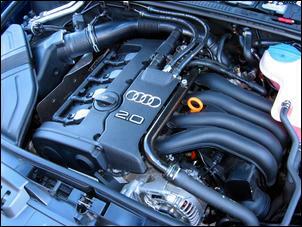 The servotronic steering is typical Audi. There isn’t much driver feedback but the wheel is well-weighted and there’s linear response. The standard 4-wheel disc brakes (ventilated at the front) feature EBD, ABS and brake assist and offer excellent stopping power. Unfortunately, finding the appropriate brake pedal pressure takes some getting used to. The brake pedal of our test car was extremely sensitive – completely at odds with the feel of the throttle. 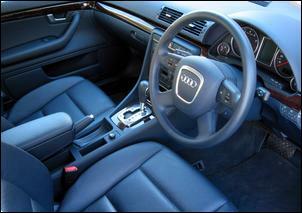 Aside from its sensitive brake pedal, the A4 is very easy to drive. 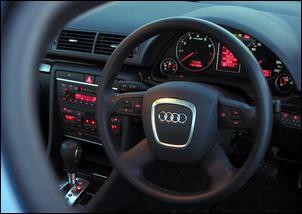 All controls are beautifully illuminated, logically arranged and the instrumentation is clear. Unfortunately, rear quarter visibility is poor due to the thick C-pillar, high boot line and bulky adjustable rear headrests. The low seating position doesn’t help. Despite its entry-level stature, the A4 2.0 litre comes with leather trim (as good as you’ll find in a top-line Audi A8), dual climate control, cruise control and an excellent multi-function display between the speedo and tacho. This display gives ambient temperature, distance to empty, audio status, gear position and any important messages. The base level Audi Chorus sound system is also surprisingly good – there’s no need to upgrade to the optional Symphony sound system. Safety is taken care of by 6 airbags, active front head restraints and a rigid cabin structure that contributes to the A4’s highly awarded crash test performances. The items you need to pay extra for (and which come standard in other models) include electric seat adjustment, a detailed fuel consumption computer and heated seats. Our test car was fitted with optional woodgrain inlays, an auto-dimming mirror and an easy-to-use electric sunroof. Interior space is not a strong point of the A4. Front accommodation is adequate but rear foot space is cramped, especially when you’re seated behind a tall driver (this is despite the new model being 38mm longer than its predecessor). Cabin width is also adequate for only two adults abreast. On the upside, the seats – both front and rear – are wonderfully comfortable. The styling is unmistakably Audi. 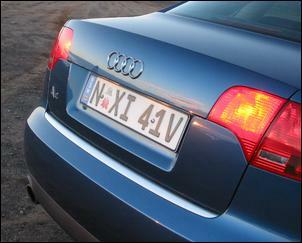 The new A4 is identified by its single frame grille with revised headlights and front bumper. The rear uses a new taillight treatment while the shoulder line is altered to give a more muscular appearance. Everything is colour-coded and the wheel arches are filled with 16 inch alloy wheels – no steel wheels masked by hubcaps here! Audi expects the A4 2.0 litre to attract entry-level luxury sedan buyers and, without doubt, it is successful in providing the same quality and feel of models that cost far more. But with a base price of AUD$51,925 it’s hard to go past the simple mechanical configuration and missing cabin equipment.